State nullification of unconstitutional acts presents one of the most contentious issues in modern American politics. Thomas Jefferson and James Madison first formalized the principles in 1798, but opponents use a later document penned by Madison to assert he never supported the idea, and in fact, opposed state nullification. Progressives and conservatives alike point to Madison’s Notes on Nullification in an attempt to delegitimize the principles. In Smashing Myths: Understanding Madison’s Notes on Nullification, Michael Maharrey digs deep into Madison’s 1835 exposition on nullification and reveals that the “Father of the Constitution” was not denying the legitimacy of nullification as understood in 1798 at all, but in fact, affirmed the principles. Maharrey analyzes Madison’s Notes on Nullification paying careful attention to context. He examines passages used by nullification opponents in light of historical context, their placement within the document itself and Madison’s other work to show that opponents misconstrue their meaning by trying to force them to stand alone. He goes on to show that while opposing a form of nullification invented by John Calhoun and other South Carolina statesmen, Madison continued to affirm Jeffersonian nullification as articulated in the Kentucky and Virginia Resolutions of 1798. 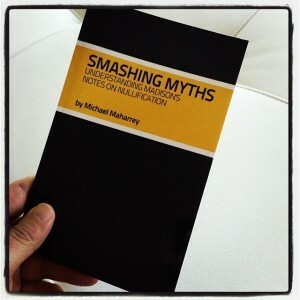 Drawing on both his experience as a journalist and knowledge gained from years studying the historical, philosophical and constitutional roots of nullification, Maharrey provides an in depth exegesis of the Notes and presents it in an easy to read, logical format. It is accessible to the layperson, but will challenge the academic. With 60 power-packed pages of information, this handbook will serve as your guide. 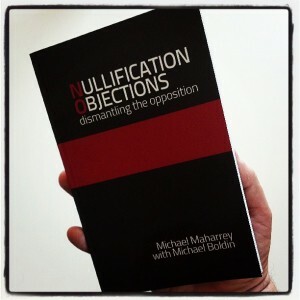 From moral and historical objections, to statements from James Madison himself, Maharrey and Boldin give you the tools you need to refute the most common objections to nullification. Nullification is logically, constitutionally and morally the rightful remedy. But there are those who don’t like the idea of the People asserting their legitimate power through their states, or even their local communities. Opponents come from the political left, the political right and even from so-called moderates. Some simply believe in the supremacy of the national government and want the opportunity to operate the levers of power to their own end. Some don’t like nullification because it throws a monkey-wrench in their efforts to advance their particular agenda – from environmental activism, to universal health care, to fighting “terrorists.” And some fight against nullification because they mistakenly believe it is rooted in the immorality of slavery and racism. In this handbook, we take an in-depth look at some of the most prominent objections to nullification and how to counter them. Along the way, you will see that nullification stands as a legitimate course of action from a historical, philosophical and moral standpoint. You will see that some of the historical assertions made by opponents are simply incorrect, and you will see the logical inconsistencies in many of their arguments. Just put a donation link in the sidebar!